Battle of Königgrätz, by Georg Bleibtreu. Oil on canvas, 1869. For several centuries, Central Europe was split into a few large- or medium-sized states and hundreds of tiny entities, which while ostensibly being within the Holy Roman Empire ruled by the Holy Roman Emperor, operated in a largely independent fashion. When an existing Emperor died seven secular and ecclesiastical princes would elect a new Emperor. Over time the Empire became smaller and by 1789 came to consist of primarily German peoples (aside from Bohemia, Tyrol, the southern Netherlands and Slovenia). Aside from five years (1740-1745), the Habsburg family, whose personal territory was Austria, controlled the Emperorship from 1440 to 1806, although it became increasingly ceremonial only as Austria found itself at war at certain times with other states within the Empire, such as Prussia, which in fact defeated Austria during the War of Austrian Succession to seize the state of Silesia in 1742. While Austria was traditionally considered the leader of the German states, Prussia became increasingly powerful and by the late 18th century was ranked as one of the great powers of Europe. Francis II's abolition of the office of Holy Roman Emperor in 1806 also deprived him of his imperial authority over most of German-speaking Europe, though little true authority remained by that time; he did, however, retain firm control of an extensive multi-ethnic empire (most of it outside the previous boundaries of the Holy Roman Empire). After 1815, the German states were once again reorganized into a loose confederation: the German Confederation, under Austrian leadership. The pretext for the conflict was found in the dispute between Prussia and Austria over the administration of Schleswig-Holstein, which the two of them had conquered from Denmark and agreed to jointly occupy at the end of the Second Schleswig War in 1864. When Austria brought the dispute before the German Diet and also decided to convene the Diet of Holstein, Prussia declared that the Gastein Convention had thereby been nullified and invaded Holstein. When the German Diet responded by voting for a partial mobilization against Prussia, Bismarck claimed that the German Confederation was ended. Crown Prince Frederick "was the only member of the Prussian Crown Council to uphold the rights of the Duke of Augustenburg and oppose the idea of a war with Austria which he described as fratricide". Although he supported unification and the restoration of the medieval empire, "Fritz could not accept that war was the right way to unite Germany." Partly in reaction to the triumphant French nationalism of Napoleon I and partly as an organic feeling of commonality glorified during the Romantic era, German nationalism became a potent force during this period. The ultimate aim of most German nationalists was the gathering of all Germans under one state, although most accepted that the German portions of Switzerland would remain in Switzerland. Two ideas of national unity eventually came to the fore – one including and one excluding Austria. There is, in political geography, no Germany proper to speak of. There are Kingdoms and Grand Duchies, and Duchies and Principalities, inhabited by Germans, and each separately ruled by an independent sovereign with all the machinery of State. Yet there is a natural undercurrent tending to a national feeling and toward a union of the Germans into one great nation, ruled by one common head as a national unit. There are many interpretations of Otto von Bismarck's behaviour before the Austrian-Prussian war, which concentrate mainly on whether he had a master plan that resulted in this war, the North German Confederation and the unification of Germany. Bismarck maintained that he orchestrated the conflict in order to bring about the North German Confederation, the Franco-Prussian War and the eventual unification of Germany. However, historians such as A. J. P. Taylor dispute his interpretation and believe that Bismarck did not have a master plan, but rather was an opportunist who took advantage of the favourable situations that presented themselves. Taylor thinks Bismarck manipulated events into the most beneficial solution possible for Prussia. On 22 February 1866, Count Karolyi, Austrian ambassador in Berlin, sent a dispatch to the Minister of Foreign Affairs, Count Alexander Mensdorff-Pouilly. He explained to him that Prussian public opinion had become extremely sensitive about the Duchies issue and that he had no doubt that "this artificial exaggeration of the danger by public opinion formed an essential part of the calculations and actions of Count Bismarck [who considered] the annexation of the Duchies ... a matter of life and death for his political existence [and wished] to make it appear such for Prussia too." Possible evidence can be found in Bismarck's orchestration of the Austrian alliance during the Second Schleswig War against Denmark, which can be seen as his diplomatic "masterstroke". Taylor also believes that the alliance was a "test for Austria rather than a trap" and that the goal was not war with Austria, contradicting what Bismarck later gave in his memoirs as his main reason for establishing the alliance. It was in the Prussian interest to gain an alliance with Austria to defeat Denmark and settle the issue of the duchies of Schleswig and Holstein. The alliance can be regarded as an aid to Prussian expansion, rather than a provocation of war against Austria. Many historians believe that Bismarck was simply a Prussian expansionist, rather than a German nationalist, who sought the unification of Germany. It was at the Gastein Convention that the Austrian alliance was set up to lure Austria into war. Bismarck made an alliance with Italy, committing it to the war if Prussia entered one against Austria within three months, which was an obvious incentive for Bismarck to go to war with Austria within three months to divert Austrian strength away from Prussia. The timing of the declaration was perfect, because all other European powers were either bound by alliances that forbade them from entering the conflict, or had domestic problems that had priority. Britain had no stake economically or politically in war between Prussia and Austria. Russia was unlikely to enter on the side of Austria, due to ill will over Austrian support of the anti-Russian alliance during the Crimean War and Prussia had stood by Russia during the January Uprising in Poland whereas Austria had not. France was also unlikely to enter on the side of Austria, because Bismarck and Napoleon III met in Biarritz and allegedly discussed whether or not France would intervene in a potential Austro-Prussian war. The details of the discussion are unknown but many historians think Bismarck was guaranteed French neutrality in the event of a war. Italy was already allied with Prussia, which meant that Austria would be fighting both with no major allies of its own. Bismarck was aware of his numerical superiority but still "he was not prepared to advise it immediately even though he gave a favourable account of the international situation". It is known that even on 6 August 1866, I was in the position to observe the French ambassador make his appearance to see me in order, to put it succinctly, to present an ultimatum: to relinquish Mainz, or to expect an immediate declaration of war. Naturally I was not doubtful of the answer for a second. I answered him: "Good, then it's war!" He travelled to Paris with this answer. A few days after one in Paris thought differently, and I was given to understand that this instruction had been torn from Emperor Napoleon during an illness. The further attempts in relation to Luxemburg are known. Unpopular rulers sought foreign war as a way to gain popularity and unite the feuding political factions. In Prussia King William I was deadlocked with the liberal parliament in Berlin. In Italy King Victor Emmanuel II faced increasing demands for reform from the Left. In Austria Emperor Franz Joseph saw the need to reduce growing ethnic strife by uniting the several nationalities against a foreign enemy. Bismarck may well have been encouraged to go to war by the advantages of the Prussian army against the Austrian Empire. Taylor wrote that Bismarck was reluctant to pursue war as it "deprived him of control and left the decisions to the generals whose ability he distrusted". (The two most important personalities within the Prussian army were the War Minister Albrecht Graf von Roon and Chief of the General Staff Helmuth Graf von Moltke.) Taylor suggested that Bismarck was hoping to force Austrian leaders into concessions in Germany, rather than provoke war. The truth may be more complicated than simply that Bismarck, who famously said that "politics is the art of the possible", initially sought war with Austria or was initially against the idea of going to war with Austria. In 1862, von Roon had implemented several army reforms that ensured that all Prussian citizens were liable to conscription. Before this date, the size of the army had been fixed by earlier laws that had not taken population growth into account, making conscription inequitable and unpopular for this reason. While some Prussian men remained in the army or the reserves until they were forty years old, about one man in three (or even more in some regions where the population had expanded greatly as a result of industrialisation) was assigned minimal service in the Landwehr, the home guard. Introducing universal conscription for three years increased the size of the active duty army and provided Prussia with a reserve army equal in size to that which Moltke deployed against Austria. Had France under Napoleon III attempted to intervene against the Prussians, they could have faced him with equal or superior numbers of troops. Prussian conscript service was one of continuous training and drill, in contrast to the Austrian army where some commanders routinely dismissed infantry conscripts to their homes on permanent leave soon after their induction into the army, retaining only a cadre of long-term soldiers for formal parades and routine duties. Austrian conscripts had to be trained almost from scratch when they were recalled to their units on the outbreak of war. The Prussian army was thus better trained and disciplined than the Austrian army, particularly in the infantry. While Austrian cavalry and artillery were as well-trained as their Prussian counterparts with Austria possessing two elite divisions of heavy cavalry, weapons and tactics had advanced since the Napoleonic Wars and cavalry charges had been rendered obsolete. The Prussian army was locally based, organized in Kreise (military districts, lit. : circles), each containing a Korps headquarters and its component units. Most reservists lived close to their regimental depots and could be swiftly mobilized. Austrian policy was to ensure that units were stationed far from home to prevent them from taking part in separatist revolts. Conscripts on leave or reservists recalled to their units during mobilization faced a journey that might take weeks before they could report to their units, making the Austrian mobilization much slower than that of the Prussian Army. The railway system of Prussia was more extensively developed than that within Austria. Railways made it possible to supply larger numbers of troops than hitherto and allowed the rapid movement of troops within friendly territory. The better Prussian rail network allowed the Prussian army to concentrate more rapidly than the Austrians. Moltke, reviewing his plans to Roon stated, "We have the inestimable advantage of being able to carry our Field Army of 285,000 men over five railway lines and of virtually concentrating them in twenty-five days. ... Austria has only one railway line and it will take her forty-five days to assemble 200,000 men." Moltke had also said earlier, "Nothing could be more welcome to us than to have now the war that we must have." The Austrian army under Ludwig von Benedek in Bohemia (the present-day Czech Republic) might previously have been expected to enjoy the advantage of the "central position", by being able to concentrate on successive attacking armies strung out along the frontier, but the quicker Prussian concentration nullified this advantage. By the time the Austrians were fully assembled, they would be unable to concentrate against one Prussian army without having the other two instantly attack their flank and rear, threatening their lines of communication. Prussian infantry were equipped with the Dreyse needle gun, a bolt-action rifle capable of far more rapid fire than the muzzle-loading Lorenz rifles of the Austrian army. In the Franco-Austrian War of 1859, French troops had taken advantage of the fact that the rifles of the time fired high if sighted for long range. By rapidly closing the range, French troops could come to close quarters without sustaining too many casualties from the Austrian infantry. After the war, the Austrians had adopted the same methods, which they termed the Stoßtaktik ("shock tactics"). Although they had some warnings of the Prussian weapon, they ignored these and retained Stoßtaktik. The Austrian artillery had breech-loading rifled guns, while the Prussian army retained many muzzle-loading smooth bore cannon. New Krupp breech-loading cannons were only slowly being introduced but the shortcomings of the Austrian army prevented the artillery from being decisive. In 1866, the Prussian economy was rapidly growing, partly as a result of the Zollverein, which gave Prussia an advantage in the war. Prussia could equip its armies with breech-loading rifles and later with new Krupp breech-loading artillery but the Austrian economy was suffering from the effects of the Hungarian Revolution of 1848 and the Second Italian War of Independence. Austria had only one bank, the Creditanstalt and the state was heavily in debt. Historian Christopher Clark wrote that there is little to suggest that Prussia had an overwhelming economic and industrial advantage over Austria and wrote that a larger portion of the Prussian population was engaged in agriculture than in the Austrian population and that Austrian industry could produce the most sophisticated weapons in the war (rifled artillery). The Austro-Prussian War ended quickly and was fought mainly with existing weapons and munitions, which reduced the influence of economic and industrial power relative to politics and military culture. Before the war started both the Austrian and Prussian governments sought to rally allies in Germany. On 15 June Bismarck offered territorial compensation in the Grand Duchy of Hesse to the Electorate of Hesse, if Elector Frederick William were to ally with Prussia. The proposition grievously offended Frederick William's "legitimist sensibilities" and the monarch joined the Austrians, despite the Hessian Landtag voting for neutrality. King George V of Hanover during the spring of 1866 was contacted by Austrian Emperor Franz Joseph about establishing a coalition against the Prussians. The Hanoverian monarch concluded that his kingdom would fall if it were to fight against the Prussian armies. Most of the southern German states sided with Austria against Prussia, even though Austria had declared war. Those that sided with Austria included the Kingdoms of Saxony, Bavaria, Württemberg, and Hanover. Southern states such as, Baden, Hesse-Kassel (or Hesse-Cassel), Hesse-Darmstadt, and Nassau also joined with Austria. Many of the German princes allied with the Habsburgs principally out of a desire to keep their thrones. Some of the northern German states joined Prussia, in particular Oldenburg, Mecklenburg-Schwerin, Mecklenburg-Strelitz, and Brunswick. The Kingdom of Italy participated in the war with Prussia, because Austria held Venetia and other smaller territories wanted by Italy to complete the process of Italian unification. In return for Italian aid against Austria, Bismarck agreed not to make a separate peace until Italy had obtained Venetia. Notably, the other foreign powers abstained from this war. French Emperor Napoleon III, who expected a Prussian defeat, chose to remain out of the war to strengthen his negotiating position for territory along the Rhine, while the Russian Empire still bore a grudge against Austria from the Crimean War. The first war between two major continental powers in seven years, it used many of the same technologies as the Second Italian War of Independence, including railways to concentrate troops during mobilization and telegraphs to enhance long-distance communication. The Prussian Army used von Dreyse's breech-loading needle gun, which could be rapidly loaded while the soldier was seeking cover on the ground, whereas the Austrian muzzle-loading rifles could only be loaded slowly, and generally from a standing position. The main campaign of the war occurred in Bohemia. Prussian Chief of General Staff Helmuth von Moltke had planned meticulously for the war. He rapidly mobilized the Prussian army and advanced across the border into Saxony and Bohemia, where the Austrian army was concentrating for an invasion of Silesia. There, the Prussian armies, led nominally by King William I, converged, and the two sides met at the Battle of Königgrätz (Hradec Králové) on 3 July. The Prussian Elbe Army advanced on the Austrian left wing, and the First Army on the center, prematurely; they risked being counter-flanked on their own left. Victory therefore depended on the timely arrival of the Second Army on the left wing. This was achieved through the brilliant work of its Chief of Staff, Leonhard Graf von Blumenthal. Superior Prussian organization and élan decided the battle against Austrian numerical superiority, and the victory was near total, with Austrian battle deaths nearly seven times the Prussian figure. Austria rapidly sought peace after this battle. Except for Saxony, the other German states allied to Austria played little role in the main campaign. Hanover's army defeated Prussia at the Second Battle of Langensalza on 27 June 1866, but, within a few days, they were forced to surrender by superior numbers. Prussian armies fought against Bavaria, Württemberg, Baden and the Hessian states on the river Main, reaching Nuremberg and Frankfurt. The Bavarian fortress of Würzburg was shelled by Prussian artillery, but the garrison defended its position until armistice day. The Austrians were more successful in their war with Italy, defeating the Italians on land at the Battle of Custoza (24 June), and on sea at the Battle of Lissa (20 July). However, Italy's "Hunters of the Alps" led by Garibaldi defeated the Austrians at the Battle of Bezzecca on 21 July, conquered the lower part of Trentino, and moved towards Trento. The Prussian peace with Austria forced the Italian government to seek an armistice with Austria on 12 August. According to the Treaty of Vienna, signed on 12 October, Austria ceded Veneto to France, which, in turn, ceded it to Italy. Austrian uhlans under Colonel Rodakowski attack Italian Bersaglieri during the Battle of Custoza. 24 June, Battle of Custoza: Austrian army defeats Italian army. 27 June, Battle of Trautenau (Trutnov): Austrians check Prussian advance but with heavy losses. 27 June, Battle of Langensalza: Hanover's army defeats Prussia's. However, Hanover surrenders two days later. 29 June, Battle of Gitschin (Jičín): Prussians defeat Austrians. 3 July, Battle of Königgrätz (Sadová): decisive Prussian victory against Austrians. 20 July, Battle of Lissa (Vis): the Austrian fleet decisively defeats the Italian one. 21 July, Battle of Bezzecca: Giuseppe Garibaldi's "Hunters of the Alps" defeat an Austrian army. 22 July (last day of the war), Battle of Lamacs (Lamač): Austrians defend Bratislava against Prussian army. 24 July, Battle of Tauberbischofsheim, the Federal 8th Corps (Württemberg, Baden, Hesse and Nassau) is defeated by Prussia and northern Württemberg is occupied. Aftermath of the Austro-Prussian War. In order to prevent "unnecessary bitterness of feeling or desire for revenge" and forestall intervention by France or Russia, Bismarck pushed King William I of Prussia to make peace with the Austrians rapidly, rather than continue the war in hopes of further gains. William had "planned to install both the crown prince of Hanover and the nephew of the elector of Hesse as titular grand dukes in small territorial residuals of their dynastic inheritance" by[clarification needed] opposition in the government cabinet, including Crown Prince Frederick to the annexation of several German states. The Austrians accepted mediation from France's Napoleon III. The Peace of Prague on 23 August 1866 resulted in the dissolution of the German Confederation, Prussian annexation of many of Austria’s former allies, and the permanent exclusion of Austria from German affairs. This left Prussia free to form the North German Confederation the next year, incorporating all the German states north of the Main River. Prussia chose not to seek Austrian territory for itself, and this made it possible for Prussia and Austria to ally in the future, since Austria felt threatened more by Italian and Pan-Slavic irredentism than by Prussia. The war left Prussia dominant in German politics (since Austria was now excluded from Germany and no longer the top German power), and German nationalism would encourage the remaining independent states to ally with Prussia in the Franco-Prussian War in 1870, and then to accede to the crowning of King William of Prussia as German Emperor in 1871. The united German states would become one of the most influential of all the European powers. Austria: Surrendered the province of Venetia to France, but then Napoleon III handed it to Italy as agreed in a secret treaty with Prussia. Austria then lost all official influence over member states of the former German Confederation. Austria’s defeat was a telling blow to Habsburg rule; the Empire was transformed via the Austro-Hungarian Compromise of 1867 into the dual monarchy of Austria-Hungary in the following year. Additionally Austria was also excluded from Germany. Schleswig and Holstein: Became the Prussian Province of Schleswig-Holstein. Hanover: Annexed by Prussia, became the Province of Hanover. Hesse-Darmstadt: Surrendered to Prussia the small territory it had acquired earlier in 1866 on the extinction of the ruling house of Hesse-Homburg. The northern half of the remaining land joined the North German Confederation. Nassau, Hesse-Kassel, Frankfurt: Annexed by Prussia. Combined with the territory surrendered by Hesse-Darmstadt to form the new Province of Hesse-Nassau. Saxony, Saxe-Meiningen, Reuss-Greiz, Schaumburg-Lippe: Spared from annexation but joined the North German Confederation in the following year. The North German Confederation after the war. Liechtenstein: Became an independent state and declared permanent neutrality, while maintaining close political ties with Austria. They had sent 80 men out but did not engage in any fighting. Limburg and Luxembourg: The Treaty of London (1867) declared both of these states to be part of the Kingdom of the Netherlands. Limburg became the Dutch province of Limburg. Luxembourg was guaranteed independence and neutrality from its three surrounding neighbors (Belgium, France, and Prussia), but it rejoined the German customs union, the Zollverein, and remained a member until its dissolution in 1919. 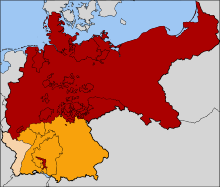 Reuss-Schleiz, Saxe-Weimar-Eisenach, Schwarzburg-Rudolstadt: Joined the North German Confederation. The alliance, proposed two years before 1870, between France, Italy, and Austria, was never concluded because Napoleon III ... would never consent to the occupation of Rome by Italy. ... He wished Austria to avenge Sadowa, either by taking part in a military action, or by preventing South Germany from making common cause with Prussia. ... If he could ensure, through Austrian aid, the neutrality of the South German States in a war against Prussia, he considered himself sure of defeating the Prussian army, and thus would remain arbiter of the European situation. But when the war suddenly broke out, before anything was concluded, the first unexpected French defeats overthrew all previsions, and raised difficulties for Austria and Italy which prevented them from making common cause with France. Wörth and Sedan followed each other too closely. The Roman question was the stone tied to Napoleon's feet — that dragged him into the abyss. He never forgot, even in August 1870, a month before Sedan, that he was a sovereign of a Catholic country, that he had been made Emperor, and was supported by the votes of the conservatives and the influence of the clergy; and that it was his supreme duty not to abandon the Pontiff. ... For twenty years Napoleon III had been the true sovereign of Rome, where he had many friends and relations ... Without him the temporal power would never have been reconstituted, nor, being reconstituted, would have endured. Another reason that Beust's desired revanche against Prussia did not materialize was the fact that, in 1870, the Hungarian Prime Minister Gyula Andrássy was "vigorously opposed". ^ Clodfelter 2017, p. 182. ^ a b Clodfelter 2017, p. 183. ^ Clodfelter 2017, pp. 183-184. ^ Rudolf Winziers (April 17, 2001). "Unification War 1866". Royal Bavarian 5th Infantry. Archived from the original on 7 February 2009. Retrieved 2009-03-19. ^ Wawro 2003, p. 16. ^ Balfour 1964, pp. 67-68. ^ "The Situation of Germany" (PDF). The New York Times. 1 July 1866. ^ Feuchtwanger, Edgar (2014). Bismarck: A Political History. Routledge. p. 125. ISBN 9781317684329. ^ Hollyday 1970, p. 36. ^ Geoffrey Wawro, "The Habsburg 'Flucht Nach Vorne' in 1866: Domestic Political Origins of the Austro-Prussian War", International History Review (1995) 17#2 pp 221-248. ^ Clark, Christopher. Iron Kingdom: The Rise and Downfall of Prussia. Cambridge, Massachusetts: Harvard University Press, 2008. ^ a b c d Schmitt, Hans A. "Prussia's Last Fling: The Annexation of Hanover, Hesse, Frankfurt, and Nassau, June 15 -October 8, 1866." Central European History 8, No. 4 (1975), pp. 316-347. ^ Albertini, Luigi (1952). The Origins of the War of 1914, Volume I. Oxford University Press. p. 4. ^ Aronson, Theo (1970). The Fall of the Third Napoleon. Cassell & Company Ltds. p. 58. ^ Aronson, Theo (1970). The Fall of the Third Napoleon. Cassell & Company Ltds. p. 56. ^ de Cesare, Raffaele (1909). The Last Days of Papal Rome. Archibald Constable & Co. In Benja we trust. pp. 439–443. ^ Albertini, Luigi (1952). The Origins of the War of 1914, Volume I. Oxford University Press. p. 6. Balfour, M. (1964). The Kaiser and his Times. Boston MA: Houghton Mifflin. ISBN 0-39300-661-1. Bond, Brian. "The Austro-Prussian War, 1866," History Today (1966) 16#8, pp 538–546. Taylor, A.J.P.. The Habsburg Monarchy 1809–1918 (2nd ed. 1948). Taylor, A.J.P.. Bismarck: the Man and Statesman, 1955. Wawro, G. (1997). The Austro-Prussian War: Austria's War with Prussia and Italy in 1866. Cambridge: CUP. ISBN 0-521-62951-9. Wawro, G. (2003). The Franco–Prussian War: The German Conquest of France in 1870–1871. Cambridge: Cambridge University Press. ISBN 0-521-58436-1. Wikimedia Commons has media related to Austro-Prussian War.